← And sew it goes: Crafty Devils get Stitchy! Join us next week for the December movie night. We’ll be showing the recently released ‘Chasing Ice’, which follows National Geographic photographer James Balog across the Arctic as he deploys time-lapse cameras designed for one purpose: to capture a multi-year record of the world’s changing glaciers. Please join us for food and drinks at the Stirling Arms Hotel from 6 pm. Film screening at 7 pm, followed by more time to socialise and chat. Note: Compared to our usual 2nd Tuesday, November is the 3rd Tuesday of the Month (19th November). We plan to get together on the Saturday just after “Chasing Ice” to fully process its implications and work through the challenges it poses. This is an important part of the “internal transition” so necessary for the overall transition our society has to go through. We will meet at the Garrick Theatre from 2 – 4.30 on Saturday 23rd November. 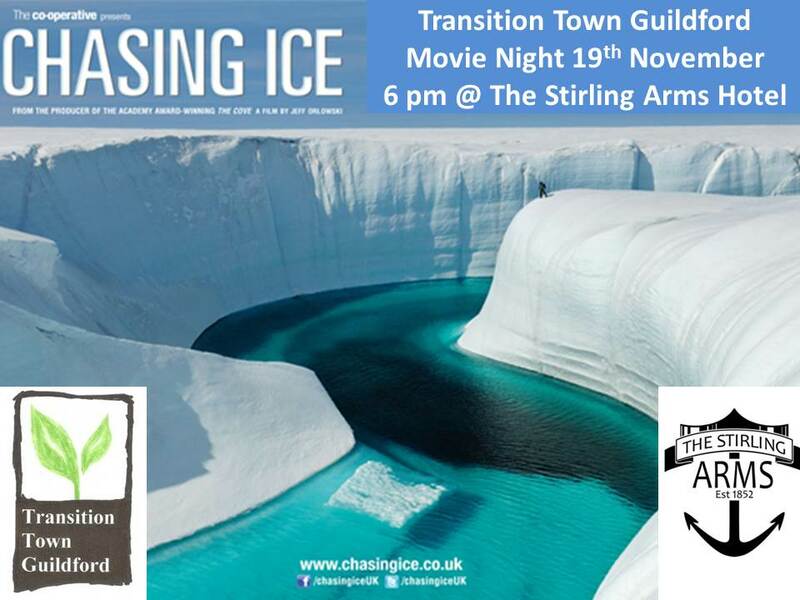 This entry was posted in Climate Change, Event, Movies and tagged Chasing Ice, Movie Night, Stirling Arms Hotel. Bookmark the permalink.